Our second generation of security camera poles, the SteadyMax Series, we are now manufacturing is the most rigid poles in the world. Our engineers have designed these poles to reduce the amount of movement and shake commonly found with many light poles. How did we do this you ask? By providing a factory-installed Vibration Suppression System inside every SteadyMax Pole. Installed are two separate Vibration Dampener Systems that work to stop both modes of vibration in their infancy. The first mode of vibration is when you see the top of a pole shaking back and forth, similar to a diving board. The second mode of vibration occurs around the midpoint of a pole and acts more like a guitar string. The Dampener at the top of the pole is an impact style design that essentially introduces an impact opposite of the vibration oscillations that interrupt the vibration and shuts it down. The second Dampener is mounted closer to the midpoint of the pole and counteracts the higher frequencies found in Second Mode vibration, in much the same way as the First Mode Dampener. Together, these two systems go after any sway and vibrations that may happen and returns the pole to the stable camera platform it is intended to be. SteadyMax Series of Camera Poles can be purchased in length of 12ft (Florida pole or the Solar & Wireless Pole) 16ft, 20ft, or the 25ft and can be ordered in our usual white or black (dark bronze) powder coat finishes. Each pole comes with our exclusive 20 Year Warranty and includes the anchor basket with the template, covers for the handhole and nut base covers. For more information on our SteadyMax series of Camera Poles check out our website or call one of our Sales Engineers @ 844-669-3537. 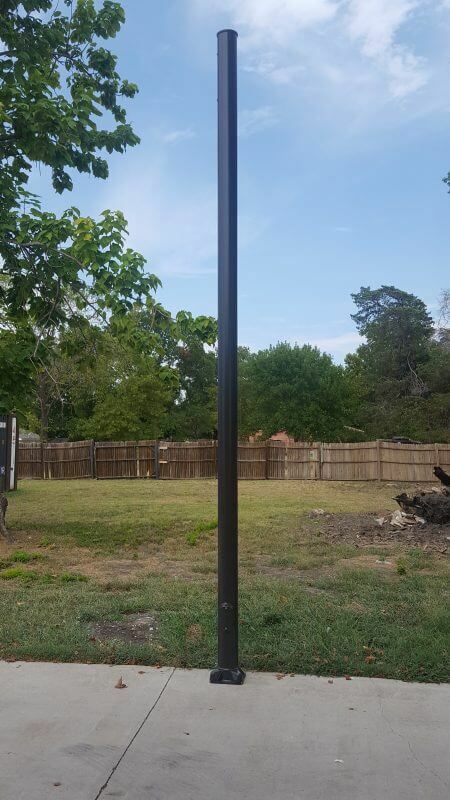 This entry was posted in Camera Poles, Camera Security Poles, Commercial Security Camera Poles, Surveillance Camera Poles and tagged Security Camera Poles.